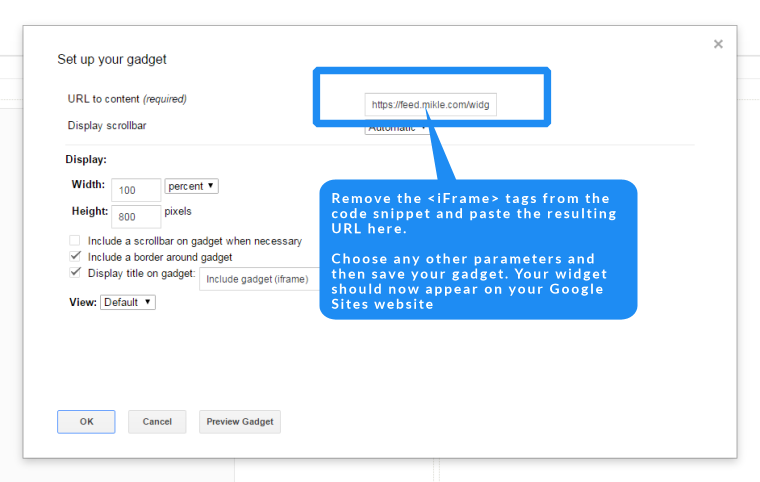 To use FeedWind as a Google Sites RSS widget, you simply need to use the iFrame version of the code snippet. When you click on the Save & Get code button after setting up your widget, there is an option to get the code as an iFrame version. To find out how to do this, please see our support page explaining how to get the iFrame code for your RSS widget. Note: Our iFrame code is HTML and includes the HTML tags for an iFrame. This tag is not required for Google Sites, all that is required is the actual URL from our code.